The Architect Series is an exclusive line of steel doors and windows with elegant narrow sight lines that improve the use of available light and increase the perception of space. 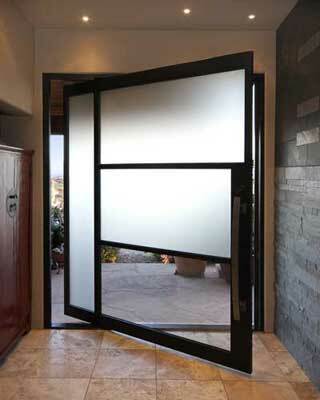 Hot-rolled steel doors and windows are extremely durable and popular in commercial and high-end residential buildings. Transform your home’s aesthetic with an architectural entry that features a modern hot-rolled steel door with clean lines and vast windows. Integrate steel windows and doors in your contemporary home or update the overall look of your home’s exterior elevation with an architectural entry. Manufactured with hot rolled steel, the Architect Series of doors and windows come standard with low-emission, Argon-filled, insulated glass to improve visibility, which may be replaced with patterned or tinted glass if customers desire more privacy. Your home’s front door is the focal point at the entrance to your home. Create a stunning first impression with a modern front door from the Portella Architect Series. Modern rectangular door designs with vast glass panels create a feeling of luxury in custom homes or commercial properties. The Architect Series of steel doors and windows showcase available light, landscaping, sculpture, water features or other design features of your home or property. Add dimension and a dramatic visual with an architectural entry that compliments an archway inside your home. Match the curves of an interior archway in your home with an iron door from the Architect Series to open up the space leading to balconies, decks, and exterior living areas. The Architect Series transforms the interior of your home or office space as an elegant separation of living space or architectural entry to a conference room. Whether connecting interior and exterior spaces or updating the entrance to your home, add a hot rolled steel door as an architectural entry to transform your property.